I had a hard time staying interested in this story line. Just seemed to be a task finishing the book. Riveting story, however overly gruesome at times. Maybe I getting too old to read this type of story. Too graphic for me but I had to get to the end. If you've got the guts so for it! The book was good, not as gripping as I thought it was going to be , had it figured out fairly early, which surprised me as that almost never happens. Talk about suspense - of course, you (the reader) will wanna know who did it ... just wait 'til you find out why! The story gets pretty intense, especially when Camille reveals her self-mutilation background. I can't wait to see what Ms. Flynn has in store next! Dark. Rivoting. A good read. 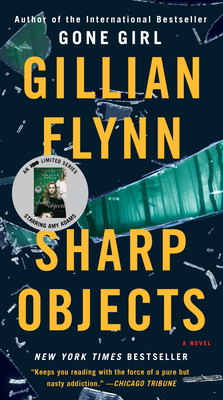 As you would expect from any book with a razorblade on its cover, Sharp Objects is very dark and angsty. Exactly how I like my books. Camille Preaker is a woman with a past. Employed as a newspaper reporter, her boss gets wind of two related murders in her home town and sends her in for the scoop. But there?s a reason Camille no longer lives in her hometown. She shows up and begins to work the scene, becoming too close to both the main suspect and the lead investigator. But there?s more going on than meets the eye. Could someone in Camille?s family be involved? Will Camille have the strength to see it through? Flynn has created a family dynamic that is rivoting. I was literally unable to put it down and read it all in one sitting. I didn't give it 5 stars because there were a few moments when I felt a little disbelief. Overall, a good read. I enjoyed it.